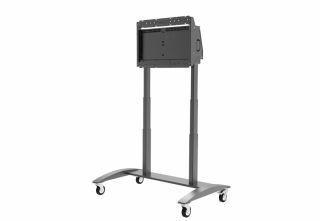 The Motorized Collaboration Cart is ADA-compliant, offering display height adjustment up to 25.6" with the touch of a button. For the utmost in safety, the Motorized Collaboration Cart is UL962 listed and features a safety limit function, which automatically reverses direction when a collision is detected in an upward, downward, or lateral force. Focusing on ease of use, the Motorized Collaboration Cart features 4" casters for rigidity and stability, and a pre-assembled design with no wiring required – making it the fastest cart assembly on the market.